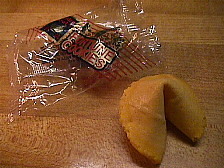 Today I’m going to take a look at Golden Bowl fortune cookies. Released by Wonton Food, Inc. out of Brooklyn, New York. Now, I have no idea where this came from, nor why it has laid around my room uneaten for months. 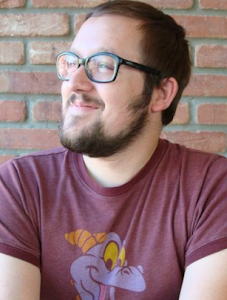 Regardless, I felt it was my duty to delve deeper and report my findings. Here you see the cookie itself, appearing harmlessly enough. 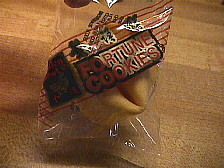 I’ve always thought fortune cookies had a cool design, sort of like a half-moon or a seashell. This thing was unfortunately too stale to still be edible. However, I did learn something. 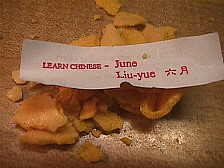 “Liu-yue” is Chinese for “June”. 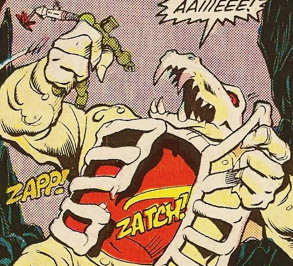 Let’s see if I can incorporate that in the proper context. My brother was born in Liu-yue. Let’s try another one. I ate the corpse of a prostitute in Pittsburgh last Liu-yue. That’s got a nice ring to it. The Review the World Opening Party!